My dad was born in the small Texas Hill Country town named after his grandfather, a grandfather he never knew. He knew neither of his grandfathers. His father knew neither of his grandfathers. His grandfather John Anderson Roberts knew only one of his grandfathers, his mother’s father. I assume he knew him because they lived in the same part of Williamson County, Tennessee for the first fourteen years of my great-grandfather’s life and the last fourteen years of my 3 x great grandfather William Giles’ life. He died in 1844. There weren’t many models for parenting and grand parenting in our Roberts line. 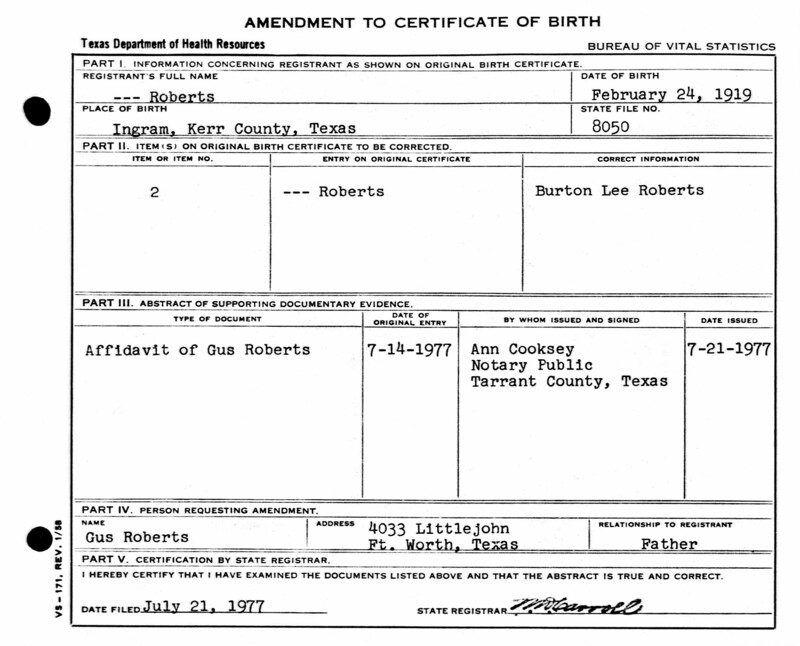 Burton Lee Roberts was born in Ingram, Texas on February 24, 1919. It was a Monday. I doubt Dad ever knew that. I wonder if it surprised Dad to discover he wasn’t given a name on the day he was born? My grandfather had to apply for the following amended certificate in 1977. My Dad’s original name? — Roberts. No given name. name was Burton Lee Roberts. He was, to the best of my detective work, named after his mother’s sister BG Chessman’s husband and his mother Emma Lee Ingram Roberts. I suspect his naming was delayed because my grandfather Gus was not in attendance at Dad’s birth and probably not even in town. Ingram is a small town in western Kerr County located about 83 miles northwest of San Antonio, Texas. My great-grandfather J.C.W. 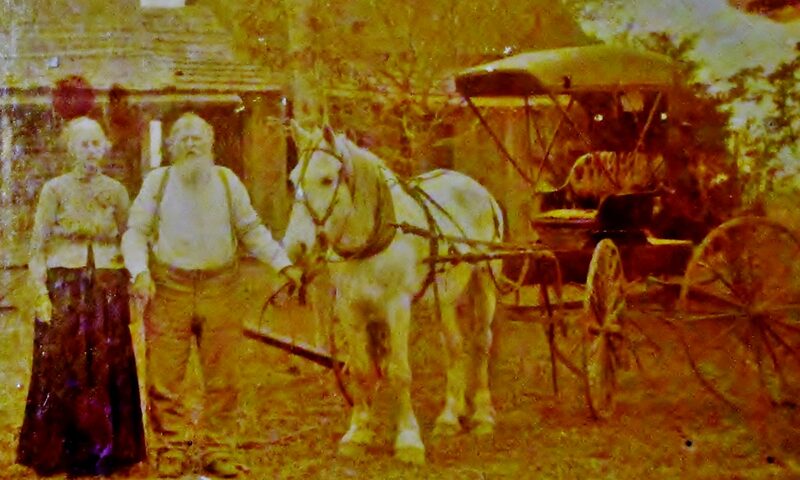 Ingram located his store and post office on the original wagon road from San Antonio to San Angelo in 1883. The historical markers all say he bought the land from the Morriss family in 1879 but the recorded deed is clear, it was 1883. The six acres were part of the original Francisco Trevino land grant. The Ingrams could not have been there in 1879 because they didn’t leave California for Texas until December of 1881. I’ve documented and written more about that in an earlier post. In the times in which Dad was born, it was common for expectant mothers to temporarily move in with or very near their mother or other female relative who would assist with the birth and/or after-care. My widowed great-grandmother’s name was Sarah Alice “Sally” Ingram. She was the offspring of a Nichols/Neely union from Williamson County before their families migrated to Texas. 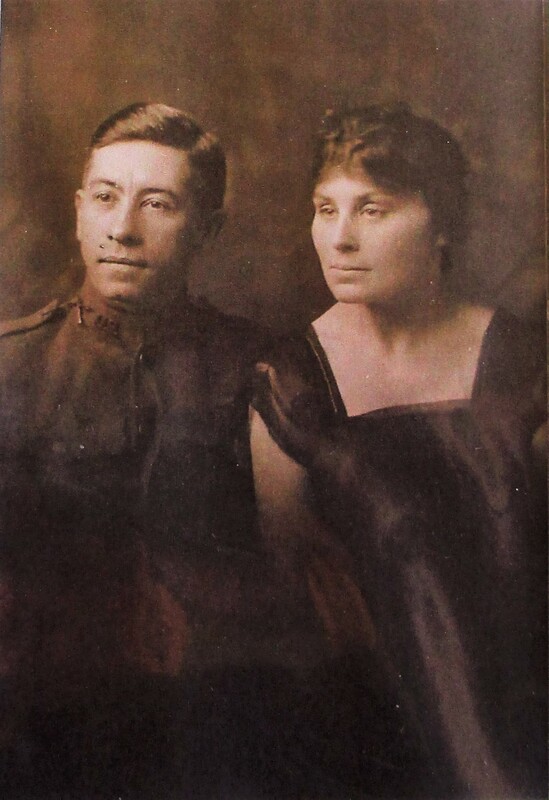 She would later accompany her pharmacist/preacher husband to Carrizo Springs, Texas where my grandmother Emma was born in 1898. She returned to her home in Kerr County after J.C.W.’s death. Great Grandmother Sally’s presence was no doubt the reason Grandmother Emma Lee was in Ingram the day my dad arrived. So, where was his father Gus? I suspect he was 83 miles away, a two or three-day journey, in San Antonio, Texas. It’s all supposition on my part. 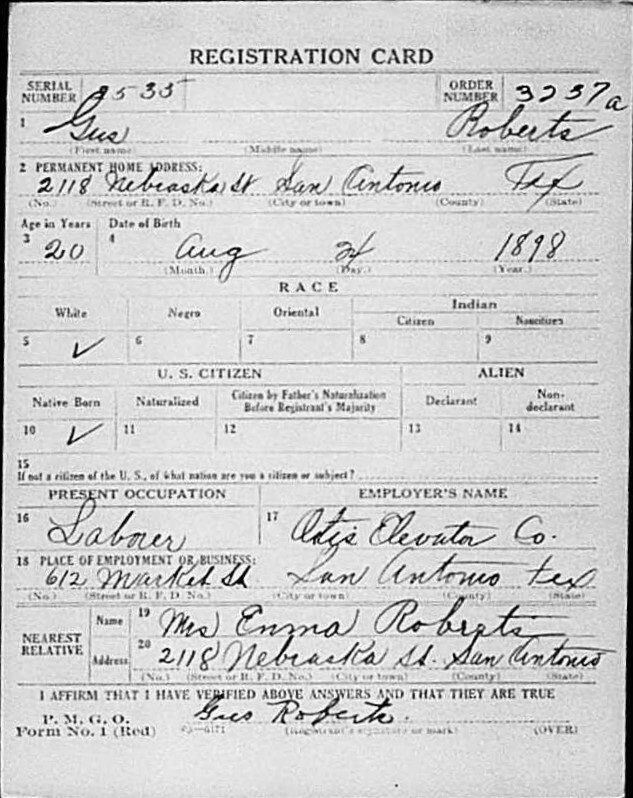 Gus Roberts registered for the World War I draft in September of 1918. The war would end two months later and another two months later my dad arrived. Gus and Emma were newlyweds living in San Antonio according to his registration. They lived at 2118 Nebraska St. He worked for Otis Elevator Company and was probably at work the Monday morning his firstborn child arrived – OR, he joined the service and was away. There are some unknowns here I have yet to uncover – a matter of an early photo of a young granddad Gus in a military looking uniform. (???) I love a good mystery! My Dad answered to several names. According to Veteran Affairs records (Ancestry.com. U.S., Department of Veterans Affairs BIRLS Death File, 1850-2010[database on-line]. Provo, UT, USA: Ancestry.com Operations, Inc., 2011) he was Burton Roberts. According to the Social Security Administration record “Nov 1938: Name listed as BURTON LEE ROBERTS; 11 Mar 1988: Name listed as BURTON L ROBERTS”. (Ancestry.com. U.S., Social Security Applications and Claims Index, 1936-2007 [database on-line]. Provo, UT, USA: Ancestry.com Operations, Inc., 2015.) Thus the S.S. Death Index list him as Burton L. Roberts. (Ancestry.com. U.S., Social Security Death Index, 1935-2014 [database on-line]. Provo, UT, USA: Ancestry.com Operations Inc, 2011.) He often signed his name B.L. Roberts. Therefore, when I wrote or spoke of him through the years I’ve referred to him as “B.L.” or “Old B.L.” His friends and family of his generation called him “Bob”. My children call him “PawPaw”. These were some of the names of Burton Lee Roberts. My dad had one more name I’ll mention. It was a name few called him. In fact, I’m the only one I remember ever calling him by this name. In my precocious teen years, I began calling my dad “Pop”. I doubt many even noticed, but he did. We talked about in one day. I brought it up. I asked him if it was okay with him. His response, “I don’t care what you call me.” But I think he liked it. I know I did. The idea came from the old Charlie Chan mystery movies. Actor Keye Luke played Lee Chan in the majority of those old black and whites. 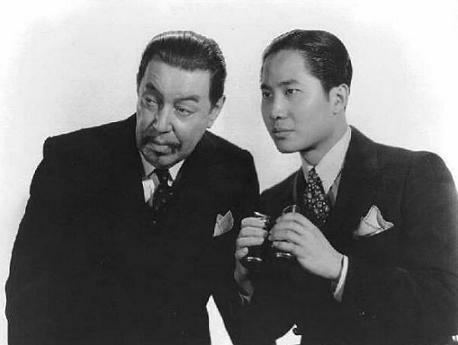 He was the oldest son of the main character, detective Charlie Chan. In the series he called his father “Pop”. He was the first one I remember using the term and the only one of the Chan children (ten or eleven I believe) who called their father by this name. It could have been seen as insolent in their culture (or mine for that matter); but it felt endearing to me. It must have felt that way to the writers of the series because Charlie never corrects his son. Dad never corrected me. Grandparents don’t always have a say in what their grandchildren eventually call them – but they generally try. The fact is most of us are stuck with the name our first grandchild can pronounce. When my wife Dee (MeMaw) and I were discussing what we wanted our first grandchild to call us, I said I wanted to be called “Pop”. It stuck. It’s my tip of the cap to “Old B.L.”.